The United States imposes tax on income using progressive rates. That means that a person's tax liabilities gradually increases as income increases. There are currently seven tax brackets, ranging from ten percent to 39.6 percent. Tax Rates are displayed by year and filing status. First are tax rates for 2015 by filing status. Next comes tax rates for 2014 by filing status. We speak of marginal tax brackets to refer to the tax imposed on the next dollar earned. This is a useful concept for tax planning, as it enables people to analyze the tax impact of additional income or additional deductions. The marginal tax bracket is the highest tax rate imposed on your income. Ordinary income tax rates apply to most kinds of income. Ordinary rates are distinguished from the capital gains tax rate imposed on long-term gains and qualified dividends. These rates are imposed by Congress and found in section 1 of the Internal Revenue Code. The income to which these rates apply adjusts every year. The IRS updates the official tax rates to take into account inflation. Everyone is entitled to a standard deduction or itemized deductions and one or more personal exemptions. Together these constitute a zero percent tax bracket, in the sense that there's no tax imposed the income represented by these deductible expenses. The ordinary income tax rates are called progressive because the tax rate that applies progressively increases as a person's income increases. A person with $1 million in income, just to take an example, would have their income taxed at all the tax brackets. Progressive tax rates are distinguished from a flat tax (in which there's one tax rate that applies to all income) or regressive tax rates (in which tax rates decrease as income increases). Marginal tax rates only tell half the story when it comes to tax planning. Also important is a person's average tax rate. This rate is a person's total federal tax liability divided by his or her total income. 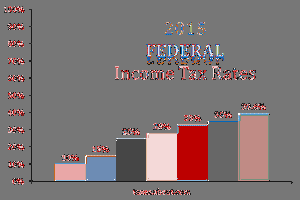 Average tax rates indicate, on average, what the federal government taxes on a person's income. To find your own average tax rate, take your total federal tax liability and divide by your taxable income.